When it comes to overcoming a challenge, it’s often said that two heads are better than one. But what if the challenge is to replace existing equipment in order to improve the quality of manufactured parts, while simultaneously reducing the workload on production staff? As it turns out, two heads are still better than one. Garlock Sealing Technologies, founded in 1887, manufactures fluid sealing solutions for industries such as petrochemical, food and pharmaceutical, mining, chemical processing and numerous others. Based in Palmyra, N.Y., the company’s sealing products include Klozure oil seals, bearing isolators and mechanical seals as well as pneumatic, hydraulic and metal seals, expansion joints and butterfly valves. For more than 15 years, the company has counted on its Koike Aronson PlatePro plasma cutting machine to manufacture retaining rings and gusset plates. After so many years in a production, however, the machine was due for a maintenance overhaul to ensure part quality would continue to meet the demanding expectations of Garlock’s customers. “Our plasma cutting machine served us so well, so when the decision was made to try and consider other options, it was an easy decision to stick with Koike Aronson,” says Trisha Perry, manufacturing engineer at Garlock. To weigh their options – and learn about alternatives to plasma – Garlock’s management team consulted with product specialists at Koike Aronson. One option was to go with high-definition plasma, such as the type featured on the PlatePro XHD, which features a Hypertherm XPR300 plasma system. Or, maybe Garlock’s team could go with a completely different option: waterjet. All agreed that the new technology was, at the very least, worth considering. A waterjet cutter was attractive because it eliminates dross and ensures that the finished part is ready for shipment as soon as it’s cut. But waterjets are known to be slower than plasma in most applications. The issue, therefore, was how to speed up that process. And as it turned out, the answer was clear: Increase the speed by going with the maximum pump size – a 90,000-psi KMT Streamline Pro III pump – and engineer a new twin-head configuration, whereby two parts could be cut simultaneously. The twin-head waterjet was an innovative solution to the challenge, but was it good enough to replace the tried-and-true plasma? 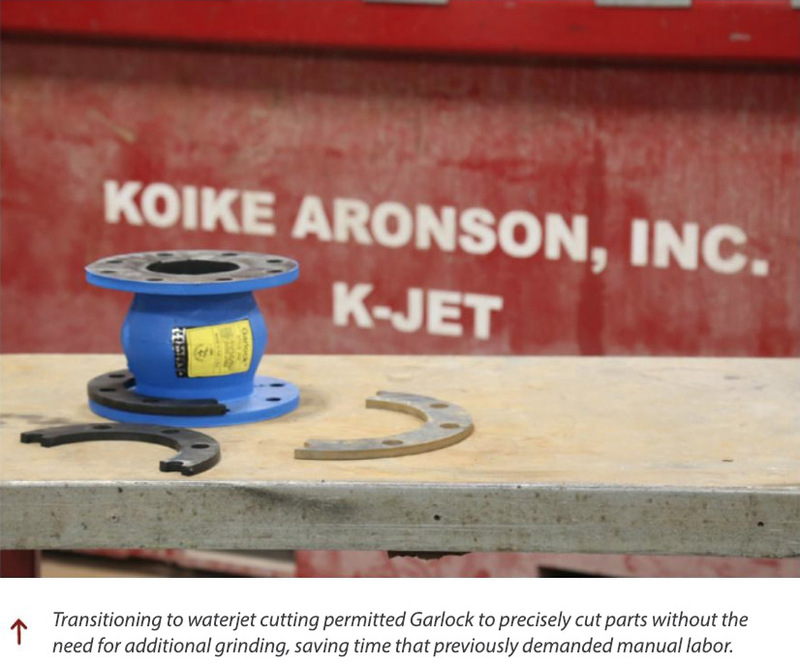 After careful consideration about the best uses of their dollars (including the option to overhaul their existing Koike Aronson plasma CNC machine), the management team at Garlock made the decision to go with the K-Jet waterjet. 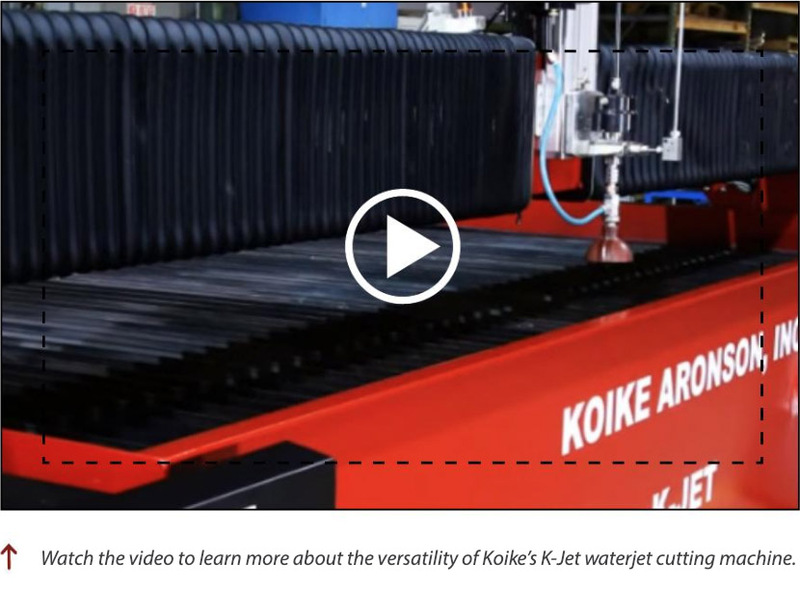 The K-Jet was launched in 2017 and replaced the company’s original CNC waterjet, the Koike-Jet. The K-Jet is available in standard table sizes up to a 6-ft.-by-12-ft. model with pump sizes up to 125 hp. In 2018, Koike introduced a bevel-head option and also developed the twin-head waterjet for this application. 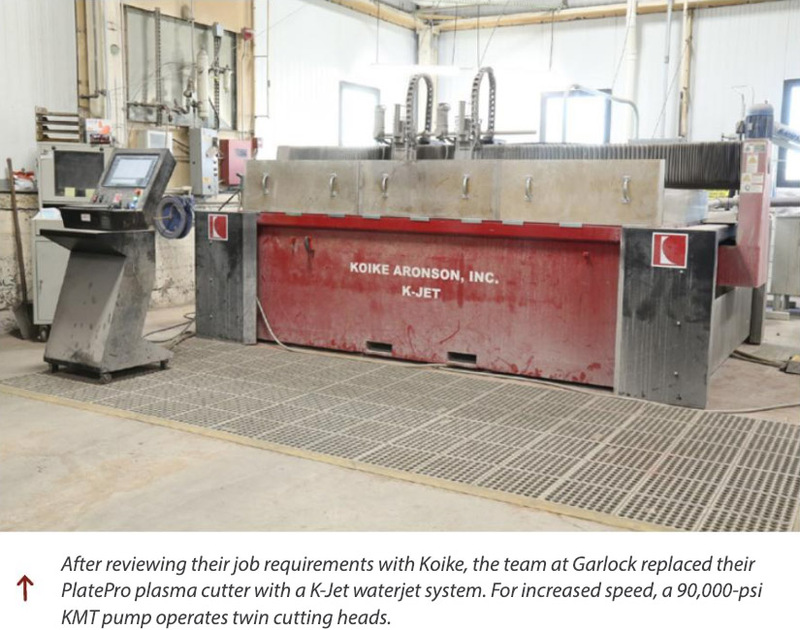 The question that remained in the minds of managers at Garlock was whether a waterjet cutting system – two heads or not – could keep pace with the speed of their old plasma cutter. By utilizing the aforementioned 90,000-psi KMT pump, Koike engineers felt confident they could make a machine that had the power to operate two heads. 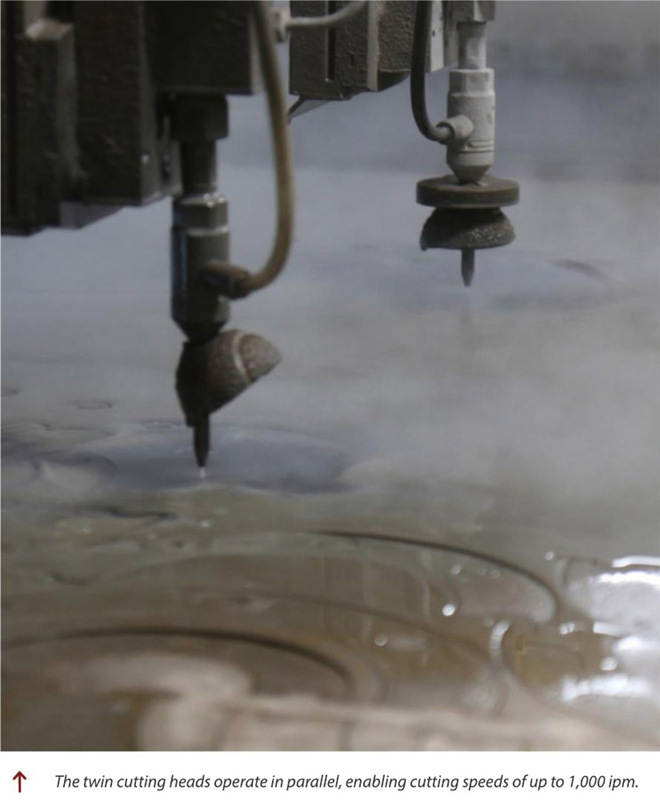 This would allow the machine to cut twice the number of parts per sheet for a given amount of time while also providing the waterjet’s well-known bonus: no additional deburring or finish work required. For Garlock, the result was perfect part quality while simultaneously eliminating post-cut grinding and the associated labor costs. A comparison of two parts side by side demonstrated the difference between an older plasma cutting machine and the new waterjet. The waterjet’s cuts were absolutely pristine, with no additional grinding required. It’s now been more than six months since the twin-head K-Jet’s installation at Garlock, and it has become part of the landscape of their production facility. Customers continue to rave about the quality of their orders, and the staff, having had time to familiarize themselves with the machine, are confidently processing parts.